Studied with the most advanced high Hooke:ion color CCD (5000 pifel x3) technology from abroad. Adopted International el first class optical lens achieved the around gaining color information from red, green and blue The effective resolution reach to 0.1mm tiny impurity signal amplification color sorted for all kinds of grains of tiny flaws and spots finally chose the excellent reject percentage. To use high brightness long life LED lighting, not only ensure the image clear and exact, but also can meet to sort multicolor separate selection, positive selection, reverse selection and multi selection, long lasting and good stability, obvious sorted effective. Fully applied special image grabbing and processing system, obtain high quality image technology. In connection with different kinds of grain going mould and germinating, design special means of shape and color computation could accurately move bad impurity from materials. To use the original imported high frequency ejectors. Which can control air flow and direction? According to the bulky grain, used big volume and high frequency ejectors so our color sorter have high rejected accuracy, strong applicability, long lasting and good stability longer life. A tractor serves several purposes, through different size of channels, not need to change lighting, just defined different color then could selection, which suitable for grains of multi food grains ore. Industrial products and flaky materials and so on. Original imported color touch screen, not need to adjust touch place, Window type human-computer interface, easy operation, flexible and easy learning. The high frequency and big volume ejectors is original imported from abroad, stable performance, reliable quality, high accuracy, long life. Backed by an industry experience of 15 years, we present a comprehensive range of premium quality Grain And Rice Cleaner Machines, Blowers And Cyclones, Grading And Sorting Machines & Rice Trading made of finest raw material and components. Our range encompasses Super Pre/Fine Cleaner, MTRA / Vibro Grain Cleaner, Destoner, Rice Length Grader, Precision Sizer and Bucket Elevator. 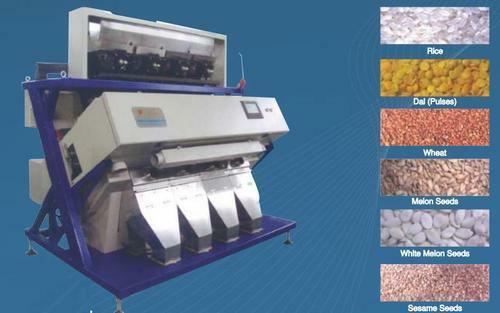 In addition, we also specialize in trading various machines including color sorter, food grains & lab equipment. Offered at cost effective prices, these machines are timely delivered with safe packaging to our clients. Supported by a pool of diligent professionals, we have been able to offer precision engineered and accurate machines. The team of well-experienced engineers and consultants also assists us in offering highly effective services for erection and modification of rice & grain mills and plants. Our professionals make judicious use of various machines and equipment installed in our sound infrastructure unit. Further, offering quality products and services within shortest possible time frame. We are continuously importing machinery like:- paddy husker, paddy separator, whitener, polishers, weighing equipment & sorter from London, Japan, America, Thailand & other country also as per our customer requirement. Our clientele include G.M. Overseas Ltd. (Delhi), Parmanand Satyanarayan Overseas (Delhi), Haldiram Foods Ltd. (Gurgaon, Haryana), Khusi Ram Bihari Lal Ltd. (Delhi and Kandla).